Cecil Lyle, The Magic Milliner (1892-1955), was the inventor of the original Ladies Hat Tear. Since then there have been many variations and improvements, some by our own Wiz Kid Eleazar in his book "Tear-Able Magic." Here's one everyone missed until now - a Leprechaun Hat Tear for St. Patrick's Day, complete with beard, a rainbow, Leprechaun gold and a flying Shillelagh. 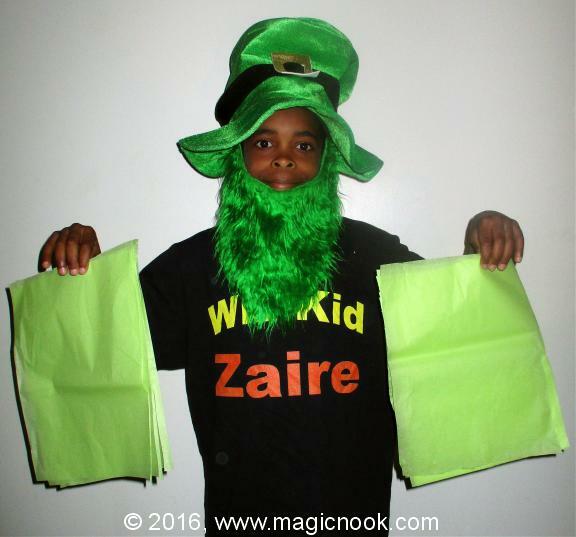 It makes use of a fabric costume Leprechaun Hat so it can be used again and again for a great many performances. That also means that you can easily change the theme by changing the costume hat, so you are not bound by St. Patrick, Leprechauns or any one holiday. Using the techniques described in this e-Book, all of the above hats (and more) can be produced by tearing up strips of colored tissue paper, folding the torn pieces and then opening them out to reveal the transformed costume hat. With or without beards and other accessories. With or without long decorative streamers (made from plastic Dollar Store table covers) that can be magically produced from the hat by your helper from the audience. Wiz Kid Qua-Fiki shows you all the tricks you need to know in step-by-step photos.